Cressida Cowell (Author) Cressida Cowell is the author and the illustrator of the bestselling How to Train Your Dragon and The Wizards of Once book series, and the author of the Emily Brown picture books, illustrated by Neal Layton. How to Train Your Dragon has sold over 8 million books worldwide in 38 languages. It is also an award-winning DreamWorks film series, and a TV series shown on Netflix and CBBC. The first book in Cressida's new series, The Wizards of Once (also signed by DreamWorks), is a number one bestseller. Cressida is an ambassador for the National Literacy Trust and the Reading Agency, a Trustee of World Book Day and a founder patron of the Children's Media Foundation. She has won numerous prizes, including the Gold Award in the Nestle Children's Book Prize, the 2017 Ruth Rendell Award for Championing Literacy, the Hay Festival Medal for Fiction, and Philosophy Now magazine's 2015 Award for Contributions in the Fight Against Stupidity. She grew up in London and on a small, uninhabited island off the west coast of Scotland and she now lives in Hammersmith with her husband, three children and a dog called Pigeon. Neal Layton (Illustrator) Neal is an award-winning illustrator and author of children's books. 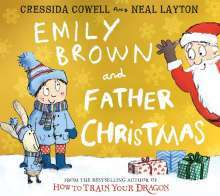 He has worked on more than 80 titles to date, working with authors such Cressida Cowell and Michael Rosen, and won several prizes including a Gold Award in the Nestle Children's Book Prize for 'That Rabbit belongs to Emily Brown'. His books have also been shortlisted for the Red House Book Awards, the Blue Peter Book Awards, the Booktrust Early Years Award, Funfzig Jahre Deutcher Jugendliteraturpreis and New York Public Library's annual list of best Children's Books. He also writes his own books, 'The Invincible Tony Spears' and the bestselling 'Mammoth Academy' Series. His books are currently in print in more than 16 languages worldwide. He lives in Portsmouth with his wife and two daughters. Neal Layton, geboren 1971 in Chichester, West Sussex, studierte Grafik-Design und Illustration in Newcastle und London. Er hat zahlreiche Bilderbücher veröffentlicht, die mit vielen Preisen bedacht wurden.